Although very little has been obvious, the past few months have seen much happening behind the scenes. The design and structure of the new building were passed by Basildon Borough Council’s Planning Officers in late November 2018, the contract for the demolition of the current building was awarded and the demolition plans are now advancing. 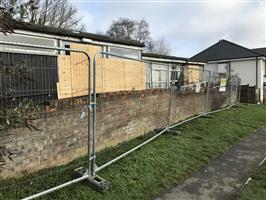 Getting a date for the disconnection of gas services from the utility company has caused a frustratingly long delay and a further delay was then caused by the arrival of squatters. We took immediate action and a court order gave the squatters 24 hours to leave. To prevent further incursions the building was boarded up and Heras fencing installed around the site. On the positive side we now expect the gas services to be disconnected during the week of 24th February with the demolition starting at the beginning of March. The demolition process is expected to take up to 3 weeks and we will be delivering letters to each residence and business in the immediate area to ensure that they are aware. We have been working with both our architects and the demolition company to ensure that they take great care during this time as this is a difficult site to access. Lorries will enter via the High Street and deposit large skips which will be filled and then removed. During vehicle access “banksmen” will be present at all times to ensure the safety of pedestrians. Many meetings have been held with our architects to ensure that the new facilities provided suit our requirements and we now have a very good idea of how we see the building being used in practice. High level costings have been identified and the construction contract has now gone out to tender with a closing date of 22nd March,. Our architects will then review the tenders, interview the companies and produce a shortlist for the Town Council to consider.